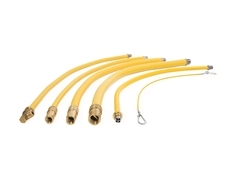 Die-Pat Caterhose gas hose assemblies standard range are available in the following sizes: 1/2"QC lengths of 1000mm, 1250mm, 1500mm and 2000mm 3/4"QC lengths of 1000mm, 1250mm and 1500mm. 1"QC lengths of 1000mm, 1500mm, and 2000mm. All supplied c/w restraining wire.